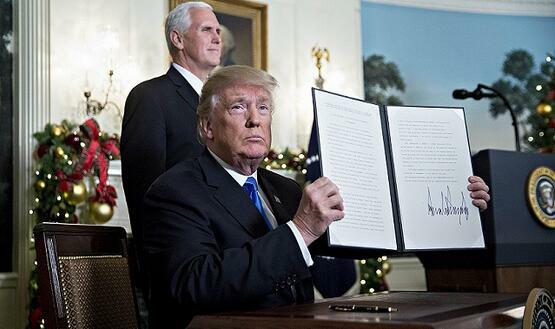 United States President Donald Trump has declared that the U.S. recognizes Jerusalem as the capital of Israel. Trump made the announcement Wednesday at the White House. He said the U.S. will begin steps to move the American embassy in Israel from Tel Aviv to Jerusalem. That process is expected to take years to complete however. The move had been expected after Trump informed Palestinian and Jordanian leaders of the U.S. decision Tuesday. Trump had promised to recognize Jerusalem as Israel's capital during his presidential campaign. The action is seen as an effort to complete a promise to political supporters, U.S. Jewish groups and American evangelical Christians. However, many political and religious leaders around the world voiced serious concerns about the move. Palestinian and Jordanian leaders condemned the U.S. plans. Palestinian President Mahmoud Abbas warned the move could have "dangerous consequences" to peace efforts in the Middle East. In a statement Wednesday, he said Trump's decision was "a declaration of withdrawal from the role (the U.S.) has played in the peace process." Jordan's King Abdullah also expressed deep concerns. He said that "ignoring the Palestinian Muslim and Christian rights in Jerusalem will only fuel further extremism and undermine the war against terrorism." Turkish President Recep Tayyip Erdogan said the U.S. recognition of Jerusalem represented a "red line" for Muslims. He also warned that Turkey may decide to cut ties with Israel. Jerusalem is home to important holy places for three major world religions: Islam, Judaism and Christianity. Israel captured the Arab area in east Jerusalem during the Six-Day War in 1967. Israel then declared the whole city its capital. However, the move is not recognized internationally. Palestinians want Jerusalem as the capital of a future state. The international community does not recognize Israel's control over the whole city but says negotiations should decide Jerusalem's status. Officials in Saudi Arabia, Iran and Egypt also warned that Trump's decision could harm peace efforts and increase tensions in the region. In Gaza, hundreds of Palestinian demonstrators burned U.S. and Israeli flags in protest. Several major European leaders – including those of Britain, France and Germany - expressed strong concerns. They said any change to Jerusalem's current status should be decided by the Israelis and Palestinians themselves. In Israel, Prime Minister Benjamin Netanyahu praised Trump's decision, calling it "historic" for his country. In his announcement, Trump said the decision was long overdue and one he believed was in the best interest of the United States. He added that the current course had failed for many years to move forward the peace process. Trump said the decision "marks the beginning of a new approach to conflict between Israel and the Palestinians." He said the U.S. "remains deeply committed" to helping both sides reach an acceptable peace agreement. Trump said he would accept a possible "two-state solution" for Jerusalem if the Israelis and Palestinians are willing to negotiate such a settlement. "We are not taking a position of any final status issues, including the specific boundaries of the Israeli sovereignty in Jerusalem, or the resolution of contested borders," Trump said. "Those questions are up to the parties involved." Just as the presidential campaign was picking up steam, riots exploded in Los Angeles. I think I'll just move forward. Prevention of forest fires is up to you. The United Nations has appealed for help from the international community. 5.He also warned that Turkey may decide to cut ties with Israel. I cut all my ties with the real world. He cut ties with the Intel insider because his sources dried up. 6.He said the U.S. "remains deeply committed" to helping both sides reach an acceptable peace agreement. Negotiators again worked right down to the wire to reach an agreement. He appeared willing to reach an agreement.